The E-Force Supercharger system (#1558 and #1559) is designed for the 2016 Camaro SS for manual or automatic transmissions. The manual transmission system will increase the stock power up to 580 horsepower and 548 ft-lbs. of torque at the rear wheels. This is a gain of 140 horsepower and 124 ft-lbs. of torque over stock! The Stage 1 Street systems (#1558 and #1559) are designed to work with all OEM emissions equipment, which will make them 50 state emissions legal (E.O. Number pending). These systems provide the best combination for your daily driver. This E-Force supercharger system features an Eaton 2300 TVS rotor assembly, an air to water twin intercooler system and dual pass heat exchanger. Performance has been optimized through a unique runner design and an integrated bypass valve that helps reduce parasitic loss under light throttle, which improves gas mileage potential. All of this technology fits under the stock hood without any modification. Outside of the power and warranty, these systems have great looks under the hood with a black powder coated supercharger assembly and bright red coil covers that will let people know… your Camaro is Edelbrock Supercharged. 15590 E-Force system for 2016 Camaro SS with 6.2L. 2016 Camaro SS LT-1 gets blown by ProCharger! Adding another LT-1 to the ProCharger family! Without a doubt ProCharger has become the proven leader in LT-1 forced induction. Since the release of the C7 Corvette 2.5 years ago, and new GM LT-1 Trucks and SUV’s shortly after, adding supercharged boost to this new direct injection LT-1 engine has become mainstream. Thanks to highly efficient ProCharger head-units and air-to-air intercoolers, creating supercharged monsters ranging from 650HP to a mind bending 1,200HP has become the new “normal.” With that being said, it’s our pleasure to announce that the new 2016 Camaro SS can now be added to the list of ProCharger blown LT-1’s. This blog is going to cover the details about this fresh new system that’s about to begin shipping. Bolt on 150+ HP and beyond! That’s right, with just 7 psi on pump gas, your 2016 Camaro SS can enjoy a gain of 150+ HP thanks to our HO Intercooled System with it’s P-1SC-1 head-unit. Full systems come with our proven tuning calibrations and a handheld programmer, to make DIY installs a breeze. Higher boost levels and horsepower gains of up to 50% are possible with an Intercooled Tuner Kit and custom tuning, and even higher with modified motors. For hyper-custom racing builds, F-Series supercharger models up to the record setting F-1A-94 can be installed without the need for trimming or additional brackets. Since we know it won’t take long before 2016 Camaro customers ask for the F-1A-94 head-unit, and 4 digit power numbers, we designed this HO system to be ready, out of the gate, for huge power numbers. To get a head start on designing a totally new system for this next generation Camaro , ProCharger engineers started with GM full vehicle CAD models, as well as having ProCharger engineers on site at the GM measuring session months before the cars release. ProCharger created a billet bracket design utilizing robust mounting points on the LT-1 motor for maximum bracket strenght. This system will firmly hold ProCharger head units ranging in size from a P-1SC-1 up to an F-1A-94. No removal of any OEM parts is needed with this bracket installation, which not only speeds up the install, but it also ensures that all factory braking, cooling, and oiling systems on the car work just as GM intended. Using a patented crank pulley design, we are able to secure a 7.65″ supercharger drive pulley onto the factory harmonic balancer. The ProCharger crank pulley works by using a system of “cam-locks” to securely grip the factory balancer, taking the load off the crank bolt, and ensuring years of service without worry. Combining this 7.65″ crank pulley with our robust ProCharger tensioner near the supercharger pulley, the system was designed for maximum belt wrap. This ensures maximum belt traction as the power levels of these systems get pushed well beyond the factory 7 psi system offering. With the best belt wrap possible, ProCharger’s tensioner is unique in design in that its not only spring loaded, but also allows the customer to add as much pre-load adjustment as they want into the belt. This tensioner has already been proven, in similar applications, to support 1300+HP when used with dedicated 8-rib belts, so handling the factory 7 psi is no stress at all. This system was designed to be the easiest Camaro supercharger system install we have ever offered (5-6 hour install time), and you can change the pulley and 8-rib belt without removing the bracket or the supercharger. GM spent a great deal of time on the airflow design of this new Camaro SS, from the new front fascia, to the three front mounted radiators. With this in mind, ProCharger decided intercoolers specifically designed for the Camaro’s horsepower and cooling needs was in order. Starting with a fresh core designs, the cross flow section of the intercooler core was increased in size to eliminate pressure drop as much as possible, while retaining cooling capacity. Understanding that customers power levels and goals will vary, ProCharger designed two intercooler models for this HO supercharger system. Stage 2 Intercooler shown, with optional “Race” bypass valve installed. Both intercooler options do not require any cooling systems to be removed on this new Camaro. These systems will come with one piece of preformed-silicone charge tubing–from the intercooler to throttle body. This helps create the best airflow possible, and also eliminates any chance of rattles or vibrations caused by metal tubing, in tight spaces (such as around the headlamps). Another added benefit of the silicone hoses around these hot radiators, is the added insulation it provides to the cool air charge inside the tubing. Tuning for full systems is included with the 7 psi stock system offering. This comes in the form of a simple-to-use hand held programmer, that also allows the customer to monitor and data log the cars systems. This handheld programmer also comes with the ability for OBD2 code scanning as well. With long-term reliability in mind, these tunes are set up conservatively from the factory to account for fuel variations across the country. As always, more power can be had from the base system with custom tuning from your dealer or tuning shop. ProCharger knows that there is always a chance that someone might eventually sell their Camaro and want to return it to stock. With that in mind, ProCharger engineering’s took the time to make sure you can return the car to 100% OEM stock. Nothing on your Camaro will be trimmed/cut/bent or modified in any manor. ProCharger has many options to help you create a truly unique system that will fit your power goals, but also look you desire under hood. If you would like more information on this new 2016 Camaro SS LT-1 supercharger system, please drop us a line. ROUSH Performance’s Phase 2 Supercharger system boosts performance to 727 horsepower for the all-new 2015-2016 Ford Mustang 5.0L V8. The ROUSH 2.3L Phase 2 Calibrated Supercharger System is part of the TVS (Twin Vortices Series) line of superchargers developed by ROUSH, raising the bar for performance and reliability. Eaton’s TVS technology rotating assembly delivers more power and better fuel economy in a smaller package, and is part of the same line that has been used and proven for years in ROUSH-built Ford Mustangs. Our Phase 2 system builds on the outstanding performance of our 2015-2016 Phase 1 supercharger system, by adding proven core components and careful calibration for an additional 57 horsepower and 65 lb-ft of torque over our 670 hp/ 545 lb-ft system. The ROUSH R2300 TVS supercharger is a roots-type positive displacement supercharger that features twin four-lobe rotors twisted 160-degrees vs older three lobe, 60 degree twist technology. The fourth lobe and the added twist, when combined with newly-redesigned air inlet and outlet ports, offers greatly enhanced thermal efficiency, higher volumetric capacity, higher operating speeds, a smoother, more efficient flow of air into the engine, and improved noise and vibration characteristics. Unlike turbocharging, the ROUSH R2300 TVS supercharger provides instant throttle response and can generate increased power through the engine’s entire power band. This EO was awarded to ROUSH Performance soon after the 50-state certification was granted for all pre-titled ROUSH Mustangs manufactured in our Plymouth Township, Michigan factory. A recent Stang TV article explains the benefits of this certification. The 2015 and 2016 ROUSH Phase 1 Mustang Supercharger (PN 421823) is the most highly engineered supercharger system on the market today. The supercharger increases the stock 5.0L Coyote V8’s output by 235 horsepower, boosting the Mustang’s power to an incredible emissions-legal 670 horsepower and 545 lb-ft of torque. An optional 3-year/36,000-mile powertrain warranty is also available. The engineering teams at ROUSH Performance and Ford Performance worked diligently for more than 18 months to perfect the system’s CAD design, product engineering, testing, engine calibration and vehicle certification. The teams performed extensive engine calibration mapping to identify and validate optimized spark, fuel and cam positioning. ProCharger: Ford Truck Owners, here comes more BOOST! The OEM’s got you covered on that first one, and we can cure your need for the second and third. ProCharger has been supercharging trucks for over 20 years, and has built a supercharged army of lifted/lowered/on-road/off-road trucks the world over. No matter if you drive a Chevrolet, Ford, or Ram we have a supercharger system for it. ProCharger delivers the coolest air charge temperatures and largest power gains on pump gas, no matter if you are racing or just looking for extra power in your daily driver. Let us dive into the new systems being added to the mix. The ProCharger HO Supercharger system for the Ford Raptor has been the benchmark for bolting on 50% or more power in an afternoon. However, with people beginning to add built motors to these trucks and using them in more and more racing activities, the Stage 2 system was created. Even though this system is design for big power in mind, its still available to be turned down for street pump gas boost levels. So now that we covered the details on the killer new Stage 2 Raptor kit, lets talk about what else is new for the F-150 platform. With the standard ProCharger system making over 535 rwhp on just 7psi of boost, it lit a fire storm of excitement on the internet. Naturally with that much excitement people started asking “when can we get the i-1 on this F-150,” and now your question can be answered. These i-1 systems create the most power per psi of boost, compared to anything else on the market. So get ready for some tire smoking, gear banging F-150’s to start hitting the streets. We can’t give away all the details yet, but imagine being able to turn down the boost when you are in an area with poor fuel quality or maybe you are just letting someone borrow the truck. Or programming a custom boost curve for your towing needs. And just as simple as it can be turned down, a simple swipe of the finger can bring all of that power and boost back in via the optional touchscreen. If you haven’t seen the i-1 in action before, we urge you to check out this video for more details HERE. 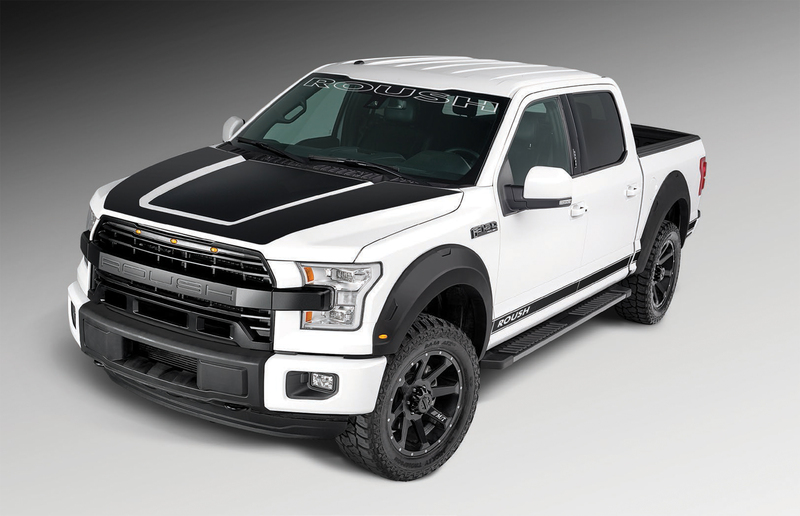 2015 F-150 Systems NOW SHIPPING, plus more Raptor Products! ProCharger does it again! And is the first air-to-air intercooled supercharger system ready to be bolted onto your brand new 2015 F-150! Ready to deliver up to 70% more power and beyond! That’s right, Ford has an all new truck, and we have 2 brand new supercharger systems to fit your needs. Ever since we loaded this blog to our website about our F-150 system coming, we got loads of emails and phone calls wanting to be put on the waiting list. Well that wait is now over, and systems are shipping now! *Higher boost levels are available for modified engines. The HO Intercooled system is based around the patented, proven and self-contained P-1SC-1 ProCharger, a compact supercharger drive system, a highly-effective, air-to-air intercooler, OEM-quality mounting brackets, tuning and all necessary supercharger and intercooler tubes for installation onto your Ford truck and SUV engine. ProCharger HO Systems come standard with a 3 core intercooler, and maintains the factory OEM injectors. Boost level is kept to a mild 6-7psi for those that are looking for that extra boost in performance, up to 55%. This system is perfect for those that live at altitude, or looking for that extra power to pass while towing a load, and is 100% reversable with no cutting/trimming/modifying needed of any factory components, which is great for those that may remove the unit before selling/trading their truck in. The Stage 2 Intercooled system keeps the same P-1SC-1 headunit, however upgrades the intercooler to the larger “Race” unit for maximum cooling potential. The boost level is also increased to 8-9psi for maximum power potential on quality (91 or better) pump fuel. Due to the large gains in HP the factory fuel injectors are upgraded to a high flow OEM units. Combinging all of these factors ensures you will now have a 500+ HP F-150 on your hands, thanks to its bolt on supercharger system. ProCharger supercharger systems feature easy installation, minimal relocation of components, no need for external oil feed and return lines and avoids having to deal the complexity and maintenance issues of an air-to-water-to-air intercooler configuration. ProCharger systems for Ford trucks and SUVs feature a visually appealing, “from the factory” look and come with a standard 3-year warranty on the intercooler and 1-year warranty on the supercharger (Optional 3-year supercharger warranty is available). Now for those of you that own a F-150 Raptor we have even more new for you! For years now our ProCharger HO intercooled Raptor supercharger system has been creating 500-600+ HP Raptors all over the country, however we have had requests for support for more power. Higher power demands come as no suprise as customers are now adding built motors and using them in racing applications. So to answer the call of our customers, ProCharger has designed another system! Stage 2 Intercooled System now comes with a new dedicated belt drive system! This new belt drive system is ready to make big power with head units as large as F-1A-94 units. With the ultra high HP nature of this system, the “Race” intercooler also comes standard with its massive 4.5″ thick air-to-air core. This intercooler offers maximum cooling, without causing any adverse conditions such as high coolant temps. Feautring a 100% custom designed core, it maintains the lowest pressure drop possible, while effectivily cooling the air charge temps on these high HP trucks. ROUSH® Performance is pleased to introduce the newest addition to the ROUSH Performance vehicle lineup: the all-new 2015 ROUSH F-150. The 2015 ROUSH F-150 features a host of aggressive body additions including: a ROUSH Front Grille with Clearance Lightning, ROUSH Front Bumper Cover, ROUSH Fender Flares with Clearance Lighting, a square “R” Hitch Cover, and a ROUSH License Plate and Frame. This F-150 wouldn’t be a ROUSH vehicle if it didn’t sound as aggressive as it looks, so a ROUSH Side-Exit Exhaust System has been added to provide a deep rumble. ROUSH has teamed with FOX to equip the ROUSH F-150 with a 2.0 Performance Series Suspension System featuring Coilovers and Shocks with Boots. ROUSH 20-inch Wheels wrapped in Mickey Thompson® Baja ATZP3 305/55 rubber sit in all four corners, and Locking Lug Nuts with a Key Bag are included. The F-150 flaunts its ROUSH bloodlines with a graphics package including ROUSH Hood Graphic, Windshield Banner, Side Rocker Heritage Graphics, and a Tailgate Graphic adorn all sides of the ROUSH F-150. There is also an optional bedside off-road-themed graphic. Inside, carpets are protected by ROUSH Molded Front and Rear Floor Liners by WeatherTech®, and a Serialized Console Badge documents the ROUSH authenticity. A ROUSH Owner’s Manual Supplement will help explain the features of the 2015 ROUSH F-150. A ROUSHcharged version of the F-150 is planned for release later this year. SuperchargersOnline is the worlds largest resource for superchargers and supercharger accessories. For over a decade we have been the leader in getting the most comprehensive information relating to anything important in the supercharger industry. We specialize in supercharger kits, supercharger parts, and hard to find supercharger accessories. Retail, Wholesale & Export specialist.